Yorkshire (2pts) win by 32 runs (D/L Method). 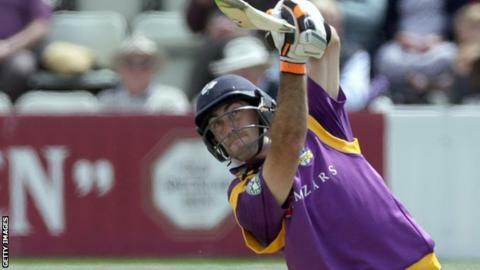 Glenn Maxwell's 65 from 51 balls steered Yorkshire to a 32-run derby win against Durham on the Duckworth/Lewis method in the One-Day Cup. Set a target of 225 by Durham, Alex Lees went cheaply with Yorkshire 14-1 but Australia all-rounder Maxwell's arrival settled the run chase. England Test discard Gary Ballance's unbeaten 26 was enough to seal victory for the visitors when rain returned. Graham Clark earlier made 42 as Durham posted what looked a competitive score. Early rain forced a late start for the Group A match and a reduction to 43 overs. Although Durham eased beyond 200 to finish on 224-7 at the end of their allotted overs, they were foiled by the inclement weather. Scott Borthwick and Phil Mustard both made 32, while Clark followed up his professional deal with a decent knock. Yorkshire's Liam Plunkett enjoyed a happy return to his former club with three wickets, while Ballance shrugged off his England disappointment with his effort. "It was nice to make a little contribution, I could have gone on to make a bigger score but it's nice to make a few runs. "We felt we played better to start with but towards the end it got a bit two-paced. "It was one of those pitches that were hard to score on but if you sat on it you couldn't lose your wicket."